The horizontal machining center ULTRATURN, developed by the German company GEORG, is designed for machining of complex and large workpiece up to 250 tons and a maximum diameter of 4,000 mm. This currently unique concept combines any possible mechanical machining technology and, for the first time, fully automatic workpiece measuring of large part on one machine. 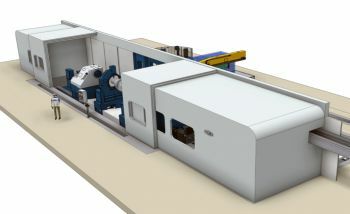 Previously, machining centers on the market were used for a maximum workpiece weight of up to 15t. With the ULTRATURN MC, GEORG approaches a new machining range, which has not been realized so far related to workpiece size and weight, accuracies and cutting forces combined with the automatic workpiece measuring unit. The ULTRATURN MC will set new standards in terms of profitability and productivity, because the reduction of downtime for machining of large workpiece has more impacts than downtime for smaller component. The machining center ULTRATURN will interest potential customers among turbine and generator manufacturers, crankshaft and driving shaft producers, forges, large gear manufacturers and the general machine building industry.